Facebook’s mission is to give people the power to build community. We know that innovation can come from people of all backgrounds, from all kinds of places. So, we want to invite you, developers, to join us in this journey by building software applications that strive towards this mission. Developers are invited to compete locally within one of the seven outlined regions of (i) North America, (ii) Latin America, (iii) Asia Pacific, (iv) India, (v) Sub Saharan Africa, (vi) Middle East/North Africa, and (vii) Europe. 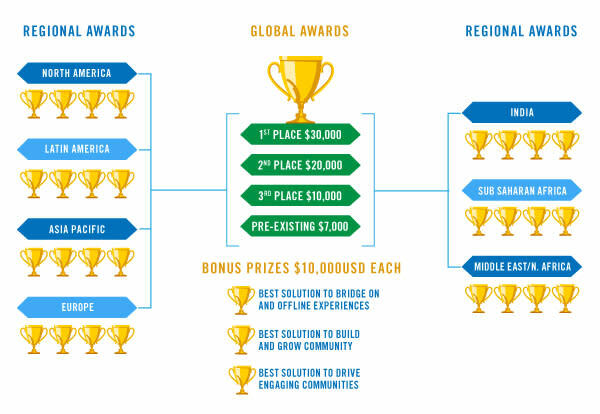 Each of the regional winners will continue to the next phase of the Global challenge. To enter this challenge, use at least one Facebook developer product to build applications that help bring communities together. You might decide to craft an awesome Messenger experience, help community leaders strengthen and grow their audience, or integrate your own technology with Facebook’s large reach. In addition, bonus prizes are available for exceptional solutions that fit into the community categories that (i) bridge on and offline experiences, (ii) build and grow community, or (iii) drive engaging communities. Main Requirement: Build software applications that help bring communities together and use at least one Facebook developer product. To compete for optional bonus prizes, developers are invited to build solutions across one of the three community categories (i) bridge on and offline experiences; (ii) build and grow community; and (iii) drive engaging communities. Demo video. (hosted on YouTube, Vimeo, or Youku). Your video should be around 2 minutes, include a demo of your working application via a step-by-step visual demo, and be available in English. Be sure to explain how the Facebook products used enhances the experience of your solution! Access. A way to access your working application for judging and testing by providing a mobile test build, a link to a live website, or a demo site where the application is deployed. Build software applications that help build community and incorporate at least one Facebook developer product. Submit solutions to your region (North America, Latin America, Asia Pacific, India, Sub Saharan Africa, Middle East/North Africa, Europe) by selecting your region on the submission form. If you build a solution that fits a specific community theme, select the bonus prize category on your submission form. You will be required to explain how your solution fits the community’s needs. Includes how well the idea was executed by the developer, the extent to which Facebook tools are leveraged and the extent to which respect for user privacy was considered in the design. Includes ability to strengthen and/or grow communities.